The Stug uniform that surfaced last year from a attic in Bergen op Zoom (Holland, StuG.Art.Brig.667 and a few Stug's assigned to FJ) was badged up like the tunic below. It showed no sign of collar tabs or litzen. There where some "shadows" of medals. The stuff that where found with it: Splinter Knockensack, fjr6 type camo helmet(green/tan). The tunic was a Heer variant, and not Luftwaffe, and far as I know there were no factory made Luftwaffe Stug uniforms. Hope this information is of use for you. No assault red waffenfarbe. 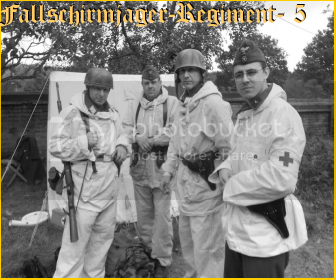 Yellow collar tabs or not, and normal FJ feldblau and yellow waffen farbe shoulder boards! The only problem you will have is getting a luftwaffe chest Eagle with a feld gray backing, ditto for the M43, although I got mine from Morigi, he might have got more in since! Hope that helps. There is a whole chapter in the FJ copy of Soldat, an essential purchase anyway! From where can I purchase said book? Its a series of books, Cyrus A Lee is the guy who wrote it, I think of the top of my head its volume 8 is fallschirmjager, but Im not at home to look for it!